The original Spy Hunter was one of my favorite games on the Commodore 64 so I was pretty excited when this remake came out. The original Spy Hunter was released as an arcade game by Bally/Midway in 1983 with ports to various game systems and computers (including the Commodore 64) soon to follow. 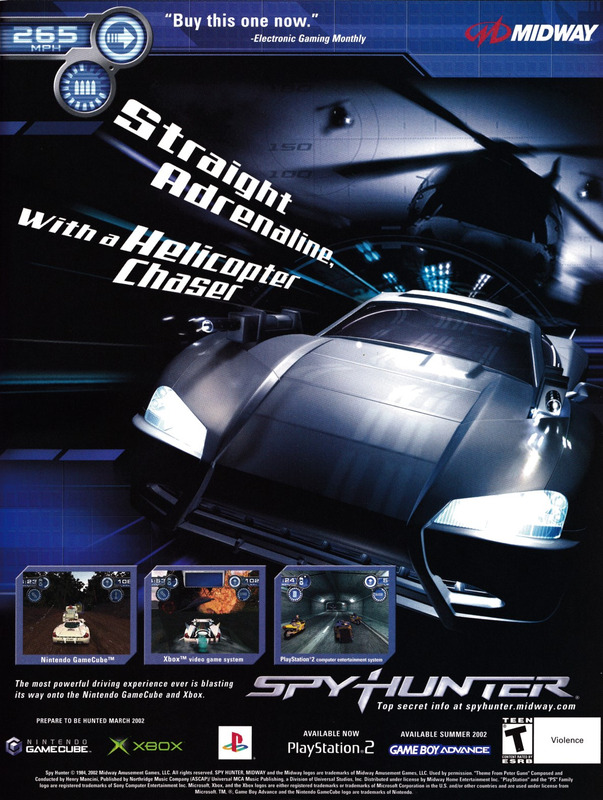 The new Spy Hunter was released in 2001 by Midway for the Xbox, PlayStation 2, GameCube and Game Boy Advance so pretty much every system out at the time. I had the GameCube version but I don’t think there were any significant differences between the different ports. The new Spy Hunter had the same basic theme as the original but obviously with much more advanced graphics and a 3D third person point of view instead of the directly overhead 2D viewpoint of the original. Overall, I would say they did a pretty good job updating the game yet keeping the original spirit intact. The music is similar, the weapons are the same, and they added a third mode for the vehicle. In the original your car could transform into a boat when appropriate but the new game adds motorcycle to the list as well. Another remake was done in 2012 for the PS Vita and Nintendo 3DS. I’m not familiar with that one but it did get positive reviews. The above ad is from the May 2002 issue of GamePro.